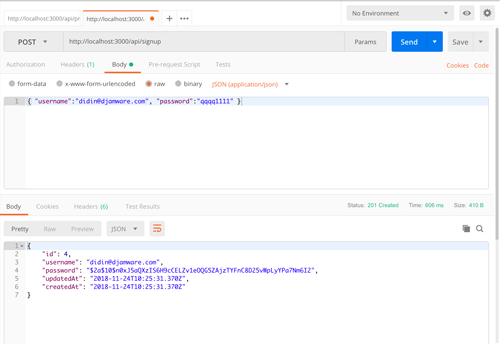 The comprehensive step by step tutorial on building secure Node.js, Express.js, Passport.js, and PostgreSQL Restful Web Service. Previously, we have shown you a combination of Node.js, Express.js, and PostgreSQL tutorial. Now, we just add a security for that RESTful Web Service endpoints. Of course, we will start this tutorial from scratch or from zero application. We will use JWT for this Node.js, Express.js, Passport.js, and PostgreSQL tutorial. We will use Sequelize-CLI to generating a new model. Type this command to create a model for `Products` and `User` model for authentication. That command creates a model file to the model's folder and a migration file to folder migrations. 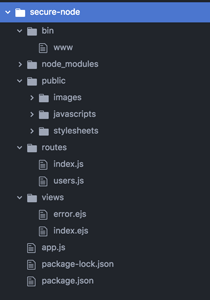 Next, modify `models/user.js` and then import this module. Add the new methods to the User model, so the `user.js` class will be like this. For the `models/product.js` there's no action needed, leave it as default generated the model class. To authenticating users and secure the resources or endpoint create this file as a router. Open and edit `routes/api.js` then declares all require variables. Create a router for signup or register the new user. Create a router for sign in or login with username and password. Create a secure router to get and post product data. Create a function for extract the token. Finally, export the router as a module. To run and test this secure Node.js, Express.js, Passport.js, and PostgreSQL Web Service, run the PostgreSQL instance first then run this command from the Terminal. 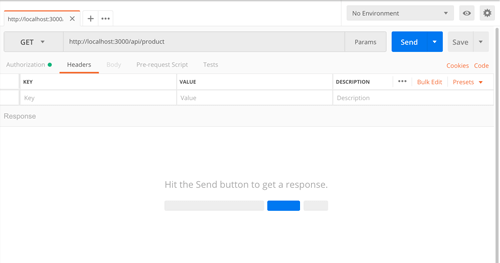 To test the secure Product endpoint, open the Postman then type fill all required fields like this image. You should get the response message `Unauthorized` and status code `401`. 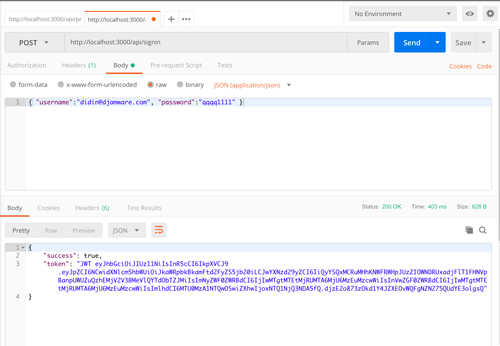 Next, test signup using the Postman by changing the method to `POST`, add the address `localhost:3000/api/signup`, add the header `Content-type` with value `application/json` and the body of request raw text like this. You should get this response when executing successfully. 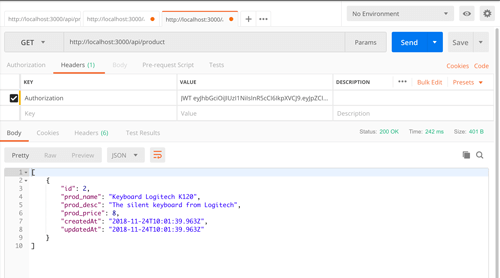 Next, test to log in with the above signed/registered username and password by changing the URL to `localhost:3000/api/signin`. You should get this response when executes successfully. Now, you can back using the previous GET method with additional header using the token get from the sign in/log in response. You should see the Product data like below. That it's, the secure Node.js, Express.js, Passport.js, and PostgreSQL Web Service. You can get the working source code from our GitHub.